Strange as it seems to 21st century sensibilities, some of the most powerful warships of the early 20th century flew not the flags of the US or Japan, nor those of the European nations that would soon be embroiled in WWI. Instead, they were home ported in South America, part of a continent wide arms race powered by natural resources and national identity. In 1912, Chile ordered 6 world class destroyers from Great Britain. 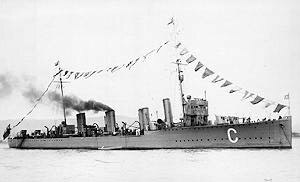 Large and heavily armed, the latter members of the class were requisitioned and modified by the Royal Navy as the Faulknor class destroyer leaders, then returned to Chile after the war as the Williams class. The first 2, however, were delivered to original design as the Almirantes Lynch and Condell. Let’s take a detailed look at these distinctively South American gunboats as a T4 DD. 100 meters long and displacing 1850 tons, they were big, burly, boats. 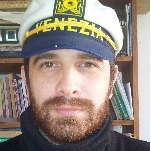 Even when more modern ships became available, they were the Chilean Navies preferred craft to patrol Tierra del Fuego, in some of the most inhospitable seas on the planet. 1850 tons translates to ~11,500 hp in-game, a very healthy hitpool for a T4 DD. Any boat bashing around Antarctic icebergs probably had a reinforced bow, so perhaps a 19mm bow section with thinner hull sides and rear. 6 x 102/40 Armstrong Mk S, export versions of the RN’s QF Mk IV. In a time when most DD’s mounted 3 or 4 guns, the Lynch class shoehorned 6 aboard using a quite distinctive arrangement. 2 guns abreast on both the forecastle and quarterdeck and one to either side of the bridge allow an average 3 gun broadside, but a little weaving brings 4 guns into play when attacking or bravely running away. Ballistically, they are a mixed bag. 722 m/s velocity is really bad, practically tied with the V-170’s 105mm guns, and only besting Isokaze’s pumpkin throwing 120mm guns in the speed department. On the plus side, however, 13 rpm is second only to V-170 in ROF, and is sufficient to place the Lynch on an even footing with the twin guns of the Clemson in terms of shells downrange. Originally built with 4 single 450mm tubes, in 1930 they were upgraded to a 2x2 533mm arrangement similar to the Faulknor’s/Williams class. Any lack in quantity can be made up in quality, however, with Mk IV torpedoes lifted from the Campbeltown. Individually hard hitting and fast, they have sufficient range for stealth torping, if aimed with enough skill. In a line known for the kind of AA that allows you to mock CV’s with impunity, Lynch has men with megaphones shouting insults, and demanding the planes go away before they are taunted a second time. The Williams (nee Faulknor) class at least added a pair of pom-poms, providing a semblance of AA cover, perhaps the basis for a bare-bones upgrade. Classic 10/1 lines give an average turning circle for a DD, though they are a bit slow. Lynch’s sister ship, the Condell, did 33.5 knots on trials, placing them just behind the Isokaze as the slowest T4 DD. WG has dictated that every nation have a gimmick, need it or not. In the case of the South American faction, I propose a ROF boosting consumable. Nearly all of the possible ships in the line are low-caliber, high ROF, dakka-dakka machines, so let’s emphasize it with a consumable that increases the ROF for 60 seconds, with a 120/180 second cooldown. I would suggest 10-20% increase, though this is obviously a balancing number. Gun arrangement puts most firepower on the fore and aft arcs. Stealth torping ability with the upgraded Mk IV fish. The Lynch serves well as a prototype to the entire SA DD tree, a slow but durable boat with high ROF, high arc guns and a small number of excellent torpedoes. It might be a bit underpowered offensively at T4, but dropping it (and that immense heath pool) to T3 would create a cap-bullying monster at a tier where there are few aircraft to keep it spotted. In Memorium, David. Fair seas and a following breeze, wherever you may sail. This a really good ship for the Panamerican tier 4 DD. First i was thinkign the Churruca, but may be they are overpowered in tier 4. By the way you make me laught with the AA review. The Argentine boats are 3 knots faster than Jianwei and have major improvements in ROF, in exchange for much shorter ranged torpedoes. I think either class are still solid T5 territory with the 4.5km ranged Whitehead torpedoes. I'll admit, I stole the megaphone line from @LittleWhiteMouse, it's impossible to come up with a more apt description of that kind of light machine gun AA armament. Not sure about using the all black camo on lower tier boats, but when the Williams class joins the game, it MUST have the stealth paint job.